The runout of Dremel rotary tools is fair at best. 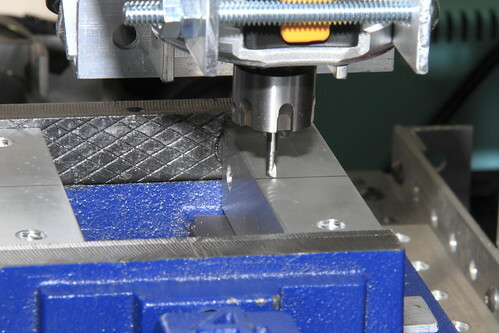 If the use of precision router bits, end mills, or drill bits is required, it's advisable to use better quality spindles, to avoid constantly breaking the tools. The DNP611 from Dewalt is recommended by Think&Tinker as an entry level router, which is the motor only version of the DWP611. 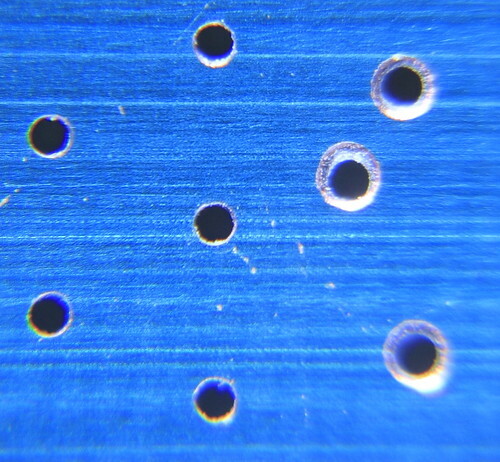 The difference between 0.024" vias drilled with a Dremel and the DNP611 (with Think&Tinker precision collet) can be seen in tab 2 on the right. 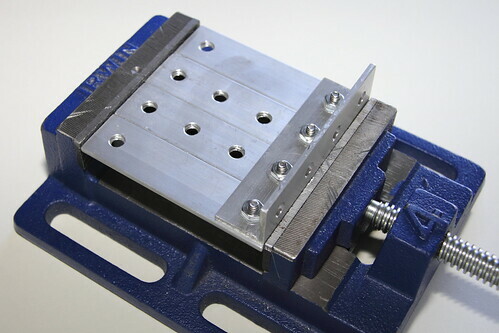 This is a short guide how to fabricate the mounting brackets. 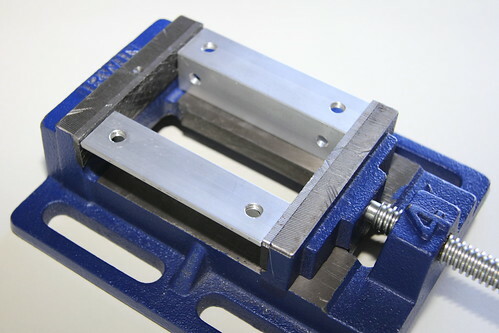 Please note, this solution is not really up to the contraptor design rules, as these parts require a little bit higher precision and are not generic — can only be used for mounting a DNP611. 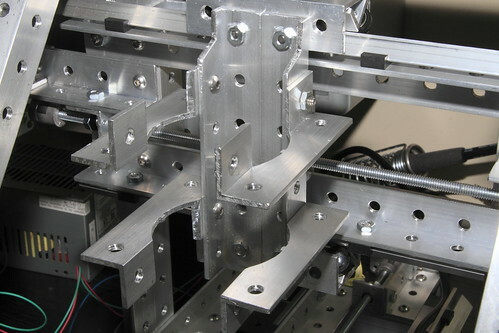 Before you can machine the brackets, you have to temporarily mount the router to the X-axis. 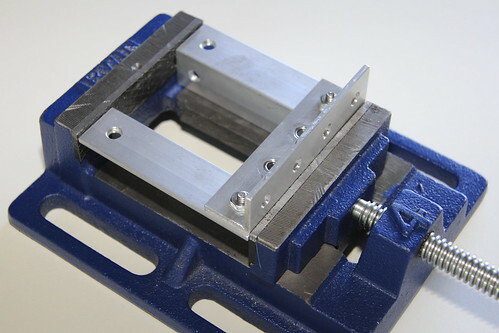 Cut the top corners of the two angle-6 that form the front of the X-axis with a hacksaw, as shown in the picture. (On the picture, the router is already mounted with the brackets, I just didn't have a picture from before, showing the cutout.) 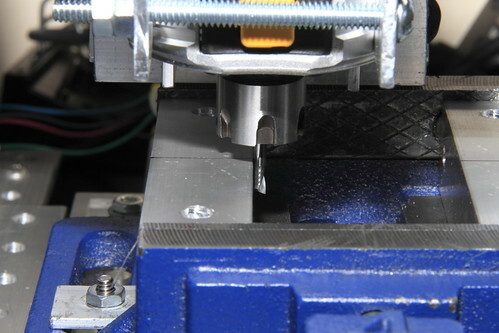 Use the top hole as guide to end the cut. It doesn't have to be very accurate. We need to do this, so that the yellow top of the router would fit. 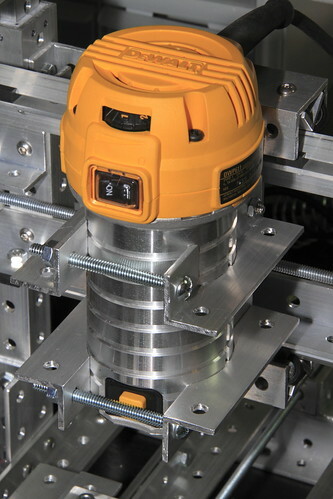 Zip tie the router to the two angle-6 at the front of the X-axis. For the milling, you can use the attached gcode, it worked on my mini-CNC. The origin is right in the middle. 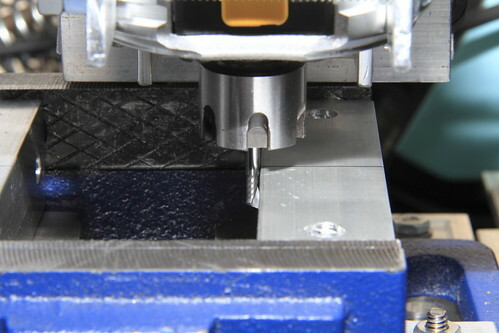 I used a 1/8" single O flute aluminum end mill from Onsrud (63-604). Fasten the three extra angle-4 and two of the ones drilled only at the ends, and place the assembly in the 4" drill press wise, as shown in the picture. Hand tighten the nuts, and hold the four lower pieces together with one hand, while tightening the wise. Tighten the nuts. Loosen the wise, remove the assembly, remove the two angle-4 from the middle, place the assembly back in the wise, and tighten it. Remove the angle-4 across, and make sure the wise is tightened well. 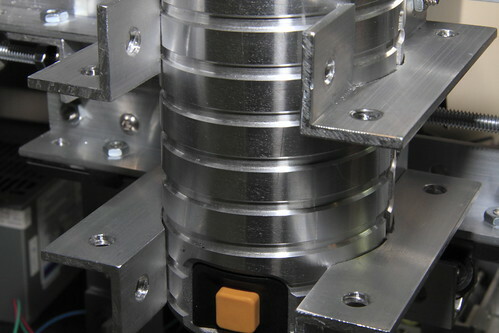 Fasten the wise with the assembly on the acrylic table of the Y-axis. Mark the middle of the brackets, position the milling tool so, that by looking over the line, it points to the center of the bit. Mark the position with a G92 command, as Y0. Position the bit so, that it touches the side of the bracket on the right. Mark this position with a G92 command as X-23.8625. 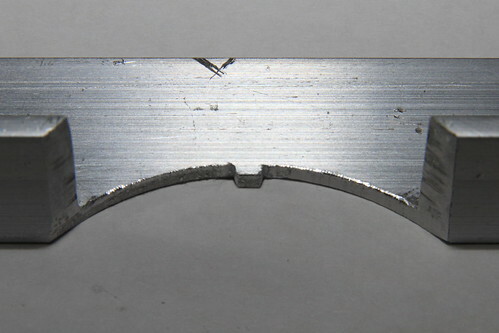 It's 1" minus half of the diameter of the tool, in millimeters. It's minus, because the XY plane is upside down when looking at the contraptor from the front. Position the bit so, that it touches the side of the other bracket. Read the position with an M114 command. It should ideally be X23.8625, but it will never be. Add the value read to -23.8625, divide the result by 2, and subtract it from the value read. In my case the value was 23.7, -23.8625+23.7=-0.1625, -0.1625/2=-0.08125, 23.7-(-0.08125)=23.78125. Mark the position with a G92 command, in my case it was X23.78125. This way the other side should be X-23.78125. 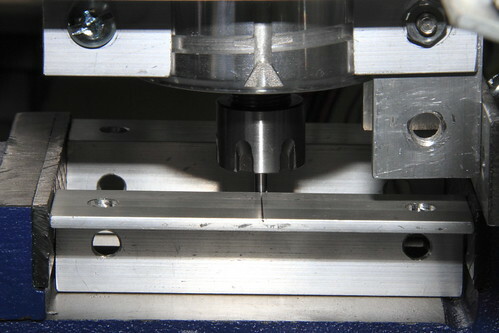 Or whatever way you can think of, make sure the X0 position is right in the middle, so that the cut will be symmetrical. Position the tip of the bit on top of the bracket on the right, and mark the position with a G92 command as Z0. Position the tip of the bit over the other bracket, and read the position with an M114 command. If it's more than Z0, mark this with a G92 command as Z0. 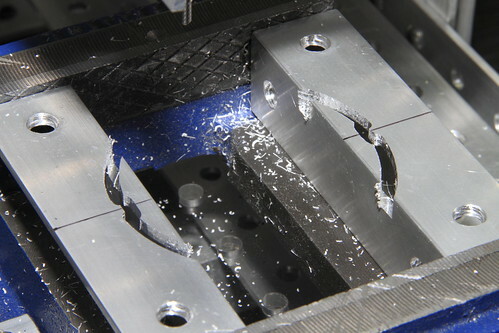 We don't want to cut too deep into either side at the first pass, and we will anyway cut deeper than the thickness of the aluminum. In my case I cut 6mm deep, since my end mill's DOC was 1/4". We will anyway have to saw off the rest in a later step. Well, the video does not show all the 15 passes, but at the end you should get something like this. 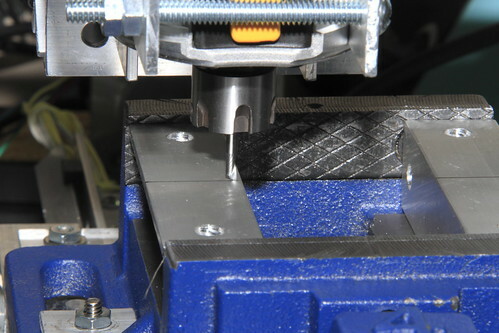 Mark the sides of the brackets with lines that extend in the direction of the depth of the cut, and saw off the middle piece. You have to cut in about a 45° angle, the ultimate goal is to have a surface tangent to the curvature of the mount surface. 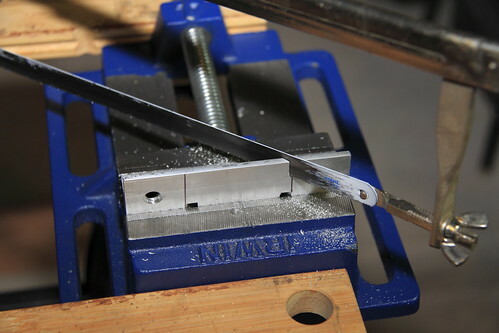 File the cut surfaces smooth, as well as square off the little tab in the middle, so that it fits snugly into the groove on the two sides of the router. You will have to repeat the above steps to make another pair of brackets. 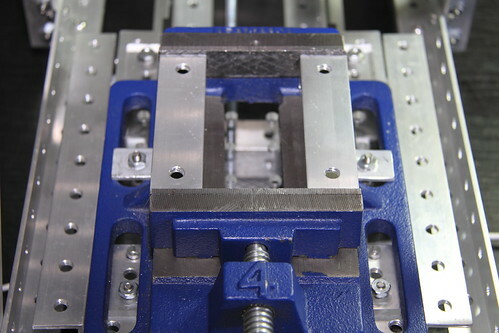 Attach the four brackets to the two angle-6 at the front of the X-axis with four 3/4" 10-24 screws, and 10-24 nuts. Tighten the nuts only on one side, you will have to almost completely loosen them on the other, to be able to fit the router in between. 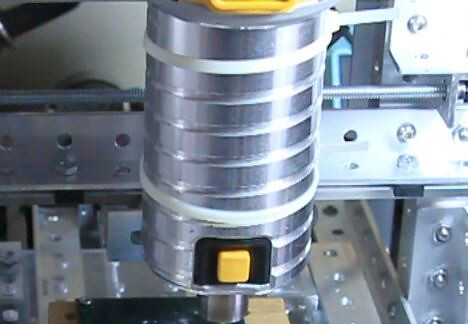 The only reason we attach both sides, because there will be no other way to thread the nuts on the screws, since the back will be blocked by the router. Loosen the nuts on one side, and fit the router to the brackets on the other side. Fit the brackets on the loose side, and hand tighten the nuts. One by one loosen the nuts, and position the brackets so, that the little tab in the middle fits in the groove on the side of the router. 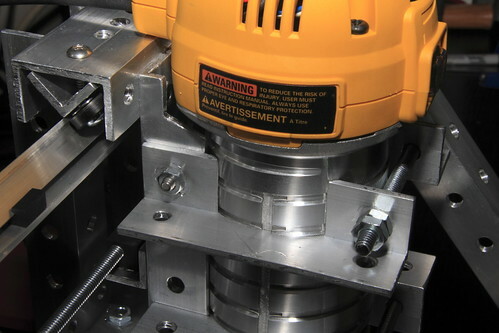 When all four brackets are in position, tighten the nuts well. Pull tight the two sides of both pairs of brackets with 3" 1/4"-20 screws, and 1/4" nuts. 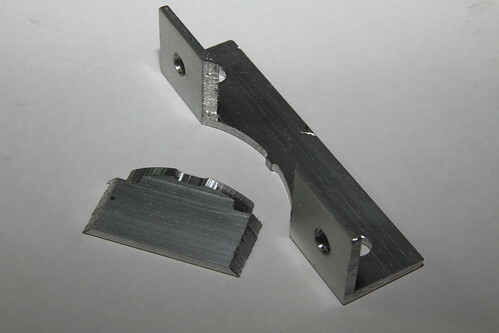 Don't over-tighten, the aluminum angles with the large hole in the middle will bend easily. Even without the 1/4" screws, the router will stand steady, they will just add some more rigidity. 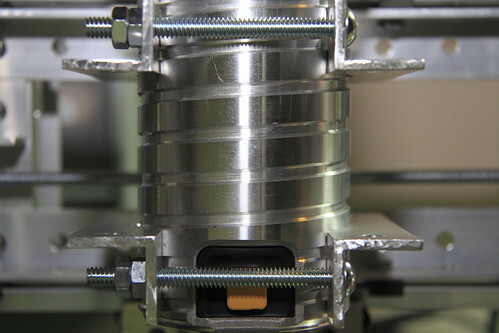 To avoid the 1/4" nut to loosen, tighten another one against it.